for tens of thousands of years, a small group of people lived in the tundra, where no one else wanted to live. they survived as a nomads; their peripatetic struggle against the elements made for a hard life and a young death, but it was their way and I would like to think, though I have no way of knowing, that they found as much happiness in their lives as we do in ours. then the white men came with guns. they told the inuit to stop moving around. the inuit could not stop moving around, they knew of no other way to live. so they kept moving around, following the fish and the caribou. and so the white men shot their dogs. and that was the end for the inuit. the white men built communities for the inuit and gave them snowmobiles, which require gas to run, and suddenly the inuit man needs something he’s never needed before: gas money. the inuit man does not know how to make money, he knows how to survive in the tundra. two generations later, the inuit still do not know how to make money, and even if they still knew how to survive in the tundra, it is a skill no longer of any use. they are trapped in between two lifestyles and trapped in settlements isolated from the western world around them by thousands of miles of roadless snow and ice. in exchange for stripping them of their lives, white men pay white men and women double-salary to come up to these settlments and run them like white towns. because there are almost no opportunities to make a living here, most of the locals are given money. all health care, including medications and plane flights to see white doctors in the south, is free. white teachers, social workers, policeman, and pilots put an ivory sheen on the long, dark winters. many of the quebec inuit are taught french instead of english, which in my mind is like taking a dying animal and pouring battery acid on its wounds. the snow, of course, couldn’t be any whiter. as a result, inuit communities are devastated by the plagues of boredom, alcoholism, domestic violence, depression, hopelessness, helplessness. my solution: either build roads to montreal and toronto so that they can construct a contemporary life for themselves, or give them back their dogs and let them follow the fish and the caribou. 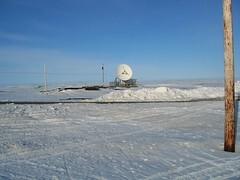 Part of the Puvirnituq photoset.